Ho Ho Ho! Two Santas in the one head bopper! Now you can easily keep track of who's been naughty, and who's been nice! 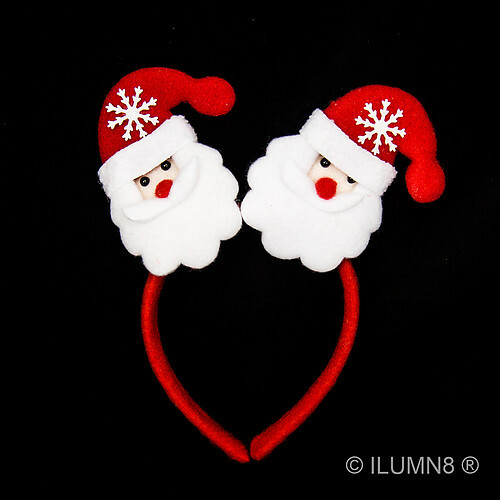 These LED Headbands are made from super soft felt. These are just what you'll need for your next Christmas party. 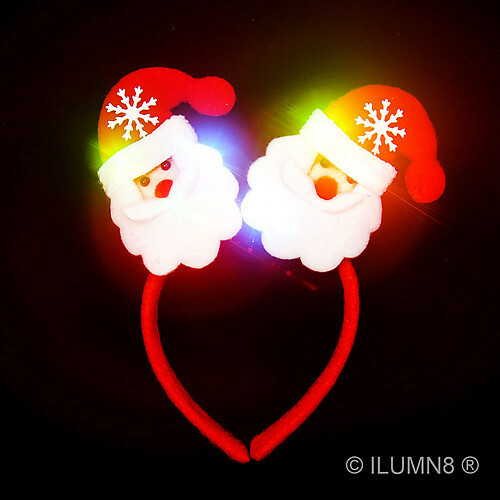 To really get the fun started simply turn on the bright red, green and blue LED lights and get ready to lead the conga sleigh line with your mittens so bright!! The LED's have multiple flash modes and are hidden inside the head of each bear. To activate simply find the button in his face, and just push to begin the light show. For glow vendors each LED headband comes individually packaged in it's own poly bag, ready for quick sales or dispersion straight out of the box. The batteries in this item are pre-installed Alkaline AG10 batteries. The battery compartment has been glued securely inside the headbopper. Batteries cannot be accessed without tools (unpicking, scissors).